The Toyota Tacoma has been a top pick among truck buyers in the market for a midsize truck for many years. Originally introduced in 1995 as a compact truck, it was enlarged to be classified as a midsize model in 2005. 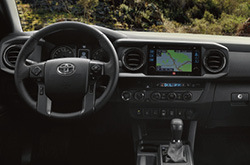 The 2019 Toyota Tacoma is included in the model's third generation, and it offers many updates to the safety features, performance capabilities and trim-specific features. Our Toyota sales team is eager to tell you more about the updates that have been made to the new Tacoma and to get you on the road for a test drive in your preferred trims. 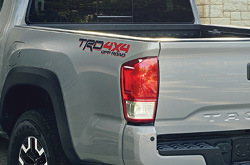 Before you decide with certainty if the 2019 Toyota Tacoma is right for you, you will need to learn about the trim variations as well as their standard and optional features. The trims for 2019 include the SR, the SR5, the TRD Sport, the TRD Off-Road, the Limited and the TRD Pro. Multiple cab configurations are available as well, including an access cab and a double cab. 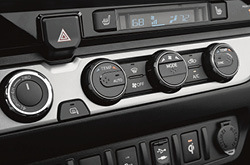 Features vary based on your desired trim, and some of the equipment that you may enjoy in your new Tacoma truck include automatic climate control, a wireless charging station, cloth or leather seats, a heated steering wheel with mounted controls, a leather steering wheel and shifting knob, power windows with one-touch functionality, speed-sensitive door locks, an auto-dimming rearview mirror, HomeLink, a navigation system, a superior sound system, an infotainment system with a color display screen, USB ports, hidden storage areas, power-adjusting sideview mirrors, daytime running headlights, privacy glass and a few additional features. When you contact our Toyota sales reps for more information about the 2019 Tacoma trims, you can set up a time for a test drive appointment. While the 2019 Toyota Tacoma is a smaller truck, it has exceptional power and performance capabilities that make this truck suitable for commuting and for your weekend adventures. Several powertrains are available for the new model year depending on the trim that you prefer. One Tacoma powertrain option is a 2.7-liter, 4-cylinder engine that registers with 159 horsepower and 180 foot-pounds for torque. Another option is a 3.5-liter, V6 engine with 278 horsepower and 265 foot-pounds for torque. These and other powertrains are mated with an automatic or manual transmission, intelligent variable valve timing, returned and high-performance Fox shocks, front coils, rear leaf springs, 31-inch all-terrain tires, computer-controlled multi-speed ascent and descent through Crawl Control, bypass zones for the shocks, rear-wheel or all-wheel drive, electric power steering and several other features. By visiting our Toyota dealership soon, you can test several powertrains to find the right one for you. The 2019 Toyota Tacoma is loaded with many carryover safety features from the 2018 model, and it has a few new standard or optional features. For example, all Tacoma trims this year will include the Safety Sense P suite, which includes adaptive cruise control, automatic high beams, a lane departure warning, pedestrian detection and a pre-collision warning. The Star Safety System is also standard, and it includes smart-stop technology, anti-lock brakes, stability and traction management and electronic brakeforce distribution. Many additional safety features are in the new Tacoma as well, such as multiple advanced airbags, child safety LATCH features, 3-point safety harnesses, a tire pressure monitoring system with tire-specific details, hill start assist and more. If you are ready to get to know more about the 2019 Toyota Tacoma and to see its new features and abilities in person, contact our sales agents today.